All transactions are safe and secure with a reliable history in online purchasing behind each of our associates. 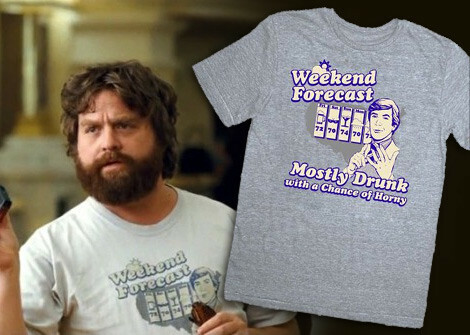 Buy the Alan's Weekend Forecast t-shirt to own Hangover clothing and merchandise. Look at this Hangover Alan shirt. While most people recognize the Hangover Human Tree t-shirt Alan wore through most of the movie, he also wore this hysterical Weekend Forecast t-shirt at the beginning. It can be seen while he is learning to count cards on the way to Vegas, as well as during check in when he is inquiring about whether Caesar ever really lived at the hotel. If your weekend plans are looking "mostly drunk with a chance of horny" then get this tee today to celebrate. Try not to steal Tyson's tiger, get married or end up in the hospital though. It seems to ruin the fun. In addition to the Alan's Weekend Forecast tee above, browse the Hangover Clothing Gallery for more apparel like men's and women's clothes, kids shirts or hoodies.